There is a lot of bad information out there being circulated about HDTV antennas. 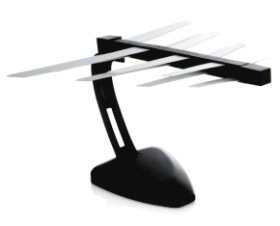 The biggest myth is that you need a special HDTV antenna to receive HDTV channels. This is absolutely untrue and any good antenna will work well for receiving HDTV. So the real question is: where can you find a good antenna? The type of antenna that you need really depends on the number of stations you can receive in your location and the strength. Predicting television reception accurately might seem like more of an art than a science, but there is still plenty of science involved. Two good web sites that can help you gauge your potential television reception are TV Fool and AntennaWeb. Both have services that can predict your reception based on your address. Considering all of the many variables involved, they both do a pretty good job. My personal favorite is TV Fool, but be sure to try them both and examine the results closely. Given a choice, most people would prefer to use an indoor rather than an outdoor antenna. Inferior performance is the main disadvantage of an indoor antenna versus an outdoor antenna. This is because you rarely can mount an indoor antenna as high and you may suffer significant signal loss from walls. The stations you can receive are numerous and strong, so you can afford to lose a little signal strength. You live in an apartment or other housing where you can’t (or aren’t allowed to) install an outdoor antenna. Two indoor antennas that I can recommend are the Philips Silver Sensor UHF/HDTV Digital Indoor TV Antenna and the Philips MANT950 Indoor/Outdoor Amplified UHF/VHF/HDTV Antenna . The Philips MANT950 looks fairly inconspicuous for an antenna, even though it is around six feet wide. It looks somewhat like a long piece of pipe and can even be painted to match its surroundings. Unlike most indoor antennas, the MANT950 is durable enough so that it can also be mounted outdoors. If you do that, you can even use it with a rotator. As proof of its inconspicuous appearance, one of the most popular locations to mount the MANT950 is near the ceiling in the room with the TV. Another popular mounting location is in the attic. Unlike many other indoor antennas, the MANT950 works with both VHF and UHF stations. The Silver Sensor is famous for its design, and some people even display it almost like a work of art. Like the MANT950, the Silver Sensor has excellent performance, although not quite to the same levels. Unlike the MANT950, the Silver Sensor works only with UHF stations, not VHF. This may or may not be a problem depending on the stations you can receive. The unusual look of the Silver Sensor results from the fact that it is a log periodic dipole, rather than the more conventional television antenna designs normally seen. The Silver Sensor doesn’t have as good performance as the MANT950, but it is much less expensive. If your stations are stronger and you don’t need VHF, then the Silver Sensor might be the better choice.